The latest version of Alpha Tracker Document Maker, the Alpha Tracker module which creates asbestos reports and other documents for asbestos and environmental consultancies, has been released. Version 1.4.377 SVN66 now supports the scaling of PDF drawings, plans and lab certificates for better results when incorporating them directly into asbestos reports. This latest software release is available for immediate download from the Start Software website. Click this link to download the file. If you need any help to install the upgrade, please do get in touch with the support desk. Google's cloud is the fastest *and* cheapest? We've been working a lot with virtual servers from Amazon lately. Virtual servers from Amazon are rent-able "cloud" servers which can be used for anything that real ("physical") servers can be used for - but they are actually sharing a physical computer's hardware with other virtual servers making them cheaper and easier to maintain. If the idea of virtual servers scrambles your brain then try thinking about this analogy. Suppose you need a PA in your business. You could either employ a real PA in your business OR you could rent the time from a virtual PA working in a call-centre. When the virtual PA isn't answering the phone for you, he or she may be answering the phone for another company helping you with their costs. Equally, if your virtual PA goes off sick, their work can be done by a colleague very easily - with much less hassle than if your employed PA went off and you had to find a replacement. (b) switching to another virtual PA is the same as switching virtual servers if the original one has a problem (easier backup!). All good? Not necessarily. Suppose you contract with The Virtual PA Company but you are not happy with their work - they take too long to answer the phone. So you switch companies to Virtual PAs R Us as they seem to offer a better service. Without realising it, you find that Virtual PAs R Us are actually using the same people to answer the phones - so you get the same bad performance as the service is actually provided by the same people! This happens with virtual servers too - sometimes performance is poor and IT server staff adjust resources on the virtual servers to try to increase performance. However... if the physical boxes hosting the virtual ones are underpowered or over-committed then the virtual servers will always be slow. Digression over - what's this got to do with the Amazon, Google or Microsoft cloud? When you rent a virtual server you need to know that the physical hardware is going to be up to the job and not over-committed running too many virtual servers. A client has just sent this link over http://www.infoworld.com/article/2610403/cloud-computing/ultimate-cloud-speed-tests--amazon-vs--google-vs--windows-azure.html which demonstrates that Google's cloud servers are not only faster than Amazon's or Microsoft's but actually cheaper too. If you need advice about switching your Alpha Tracker or other system to the cloud, do get in touch. In this fast-moving area it isn't easy to keep up and sometimes some plain-English advice can really help. What a week! Two of the biggest asbestos consultancies in the UK have gone live with Alpha Tracker, the end-to-end system for environmental, health & safety and asbestos businesses. 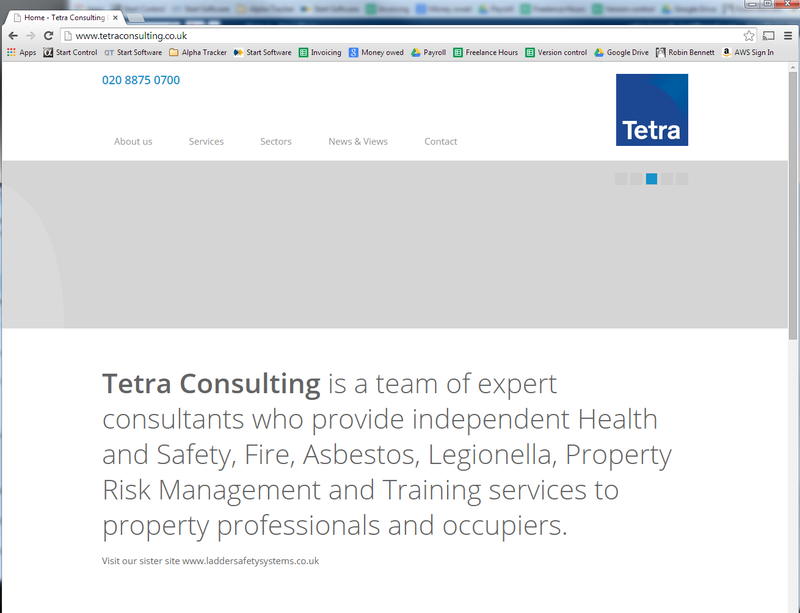 Tetra Consulting are one of our favourite clients. Based in Wandsworth, we have been working with Tetra's talented admin and field staff on a range of software projects over a number of years and have this week switched them to Alpha Tracker. We're fast heading towards fifty (50!) asbestos consultancies using Alpha Tracker now joining our loyal customer base operating Tracker, the desktop version of the system. The consultancies range from the smallest one-person operations through to companies with hundreds of site and office staff. Do contact us if you would like to discuss how Alpha Tracker could help your asbestos consultancy to save time and money. We'd love to hear from you. Founded in 1979, Shield Environmental offers end to end asbestos, environmental and risk management services from its offices across the UK. This week we have been busy at Shield's Bristol HQ training admin staff and management to use Alpha Tracker, the leading system for asbestos and environmental consultancies. Shield will be going live the New Year enabling their admin and field staff across the company to increase productivity and automate their operations. Shield - established in 1979! The end of a long day - 24 new Alpha Tracker users trained! The Start Software support desk (0845 612 2402) has had another difficult month but has managed to improve on October's disappointing stats (see http://robinbennett.blogspot.co.uk/2014/11/support-stats-for-october-2014.html). Last month we solved 95% of high priority issues on time and 88% of all queries logged. Altogether, we took just under 500 calls from customers needing help or asking questions. Alpha Tracker reaches version 1001! 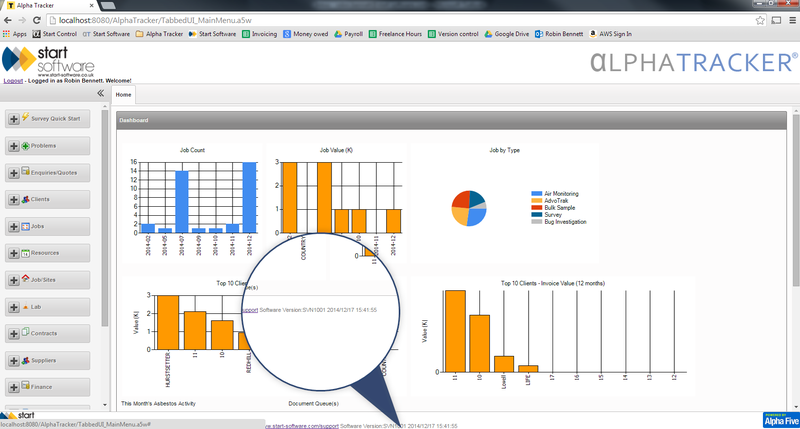 We've just released another update to Alpha Tracker, our software system for asbestos and environmental consultancies. This was update SVN1001 - in other words, we've added over 1000 features and improvements since we started creating the system last year! Let us be the first to wish you a Happy Christmas! We'll only be closed on the Bank Holidays (Christmas Day, Boxing Day and New Year's Day) so if you need us, call us! The normal support line 0845 612 2402 will be available 24x7 every working day. Regular customers may receive a small token of our appreciation over the next few days - hope you enjoy the small gifts we have sent and thanks again for your business and support throughout 2014. Hope you have a prosperous 2015. We've been working with a logistics consultancy over the last year or so to provide Alpha Five software development and support resource. The consultancy has now launched the fruit of our collective labours in the form of a major logistics system - Kontrol - which is now being used by manufacturers and logistics companies for asset tracking, control and charging. Angus Wolfendale, the consultancy's Managing Director, has been a delight to work with and as the live date has approached we've worked increasingly closely in order to get the software ready for launch. "We are pleased to appoint Start Software as our support and development partner. They have provided excellent support during the launch of our SaaS application to a global logistics organisation"
Thanks Angus and good luck. November 2014's monthly update to Alpha Tracker is now publicly available. This is update SVN962. Here is a YouTube video which runs through some of the key changes: http://www.youtube.com/watch?v=7e05A3dsj24. We've really focused on performance this month - the Project List in particular. This November update has 110 new features, improvements and bug fixes to the software since the October update. In the video above you can see some of the key changes including the enhancements to the calendar. For full details, see the release notes at the bottom of the Alpha Tracker product page for more information. Don't you just love an ISO9001 visit! We've had our 3-yearly ISO9001-2008 certification visit today... what fun! New auditor, new checks, same result - we passed with flying colours thanks to our Quality Manager Kim's hard work. As far as we know we are still the only asbestos software company with Quality accreditations (see http://robinbennett.blogspot.co.uk/2014/04/result-of-iso90012008-audit.html and http://www.start-software.com/about-us/certifications/) - it is very hard work to keep to the quality standard but we think it is worthwhile. Hope you think so too!